To synchronize and deliver unrivaled, full-spectrum, deployment and distribution solutions. The United States Transportation Command (USTRANSCOM) is one of nine unified commands of the United States Department of Defense. The mission of USTRANSCOM is to provide air, land and sea transportation for the Department of Defense, both in time of peace and time of war. USTRANSCOM, located at Scott Air Force Base Illinois, was established in 1987. As the single manager of America's global defense transportation system, USTRANSCOM is tasked with the coordination of people and transportation assets to allow the US to project and sustain forces, whenever, wherever, and for as long as they are needed. The current commander of USTRANSCOM is General William M. Fraser III, USAF. He took over command on October 17, 2011. USTRANSCOM coordinates missions worldwide using both military and commercial transportation resources. It is composed of three service component commands: The Air Force's Air Mobility Command, the Navy's Military Sealift Command and the Army's Surface Deployment and Distribution Command. The Joint Enabling Capabilities Command which was part of the former U.S. Joint Forces Command disestablished as of 4 August 2011 and is now part of the U.S. Transportation Command. Air Mobility Command (AMC), the air component of USTRANSCOM, is also located at Scott AFB. The AMC fleet can provide refueling capability and deliver people and cargo anywhere around the globe in a matter of hours. Aircraft assets of the command include: C-17 Globemaster III, C-5 Galaxy, C-130 Hercules, KC-135 Stratotanker, and KC-10 Extender. Additional long-range airlift aircraft are available during national emergencies through the Civil Reserve Air Fleet, a fleet of commercial aircraft committed to support the transportation of military forces and material in times of crisis. Military Sealift Command (MSC) USTRANSCOM's sealift component, provides efficient sea transportation worldwide for DoD in peace and war. Located in Washington, D.C., MSC uses a mixture of government-owned and commercial ships for three primary functions: Surge sealift, principally used to move unit equipment from the United States to theaters of operations all over the world; prepositioned sealift, comes under USTRANSCOM's command once the ships have been released into the common-user fleet; and sustainment sealift, the life line to keep deployed forces continuously supplied. MSC assets include Fast Sealift and Ready Reserve Force ships. In addition, MSC charters and books space on commercial ships. Military Surface Deployment and Distribution Command (SDDC), located at Scott Air Force Base, Illinois, with its Operations Center (G-3) at Fort Eustis, Virginia (scheduled under Base Realignment and Closure to move to Scott AFB in late 2010), is the overland lift component and primary surface distribution manager for USTRANSCOM. SDDC's mission is to provide global surface deployment command and control and distribution operations to meet National Security Objectives in peace and war. SDDC has a presence in 24 water ports worldwide. In an average year, SDDC manages and directs the movement of 3.7 million measurement tons (4.2 million m³) of ocean cargo, 500,000 personal-property moves, 600,000 domestic freight shipments, 72,000 privately owned vehicles and 518,000 passengers. SDDC assets include 10,000 containers and 1,350 railroad cars. Within the United States, the SDDC works with the Federal Highway Administration to designate the Strategic Highway Network. Joint Operational Support Airlift Center (JOSAC) specializes in the airlift of senior defense officials within the continental United States. JOSAC is located at Scott Air Force Base, Illinois. Joint Planning Support Element (JPSE) – Provides rapidly deployable, tailored, ready, joint planners, operators, logisticians, knowledge managers and intelligence specialists in order to accelerate the formation and increase the effectiveness of newly formed joint force headquarters. JPSE is co-located with the JECC headquarters at Naval Station Norfolk, Virginia. Joint Communications Support Element (JCSE) – Provides rapidly deployable, enroute, early entry and scalable command, control, communications, computer, intelligence, surveillance and reconnaissance (C4ISR) capabilities across the full spectrum of operations in order to facilitate rapid establishment of joint force headquarters and bridge joint C4ISR requirements. JCSE is located at MacDill Air Force Base, Florida. Joint Public Affairs Support Element (JPASE) - Provides ready, rapidly deployable, joint public affairs capabilities to combatant commanders in order to facilitate rapid establishment of joint force headquarters, bridge joint public affairs requirements and conduct public affairs training to meet theater information challenges. JPASE is located in Suffolk, Virginia. World War II, the Berlin blockade, the Korean War, and the Vietnam War all demonstrated the need for the United States to maintain a capable and ready transportation system for national security. In 1978, however, command post exercise Nifty Nugget exposed great gaps in understanding between military and civilian participants: mobilization and deployment plans fell apart, and as a result, the United States and its NATO allies "lost the war". Two major recommendations came out of Nifty Nugget. First, the Transportation Operating Agencies (later called the Transportation Component Commands) should have a direct reporting chain to the Joint Chiefs of Staff (JCS). Second, the JCS should establish a single manager for deployment and execution. As a result, the JCS formed the Joint Deployment Agency (JDA) at MacDill Air Force Base in Florida in 1979. Despite its many successes, the JDA could not handle the job. Although the JDA had responsibility for integrating deployment procedures, it did not have authority to direct the Transportation Operating Agencies or Unified and Specified Commanders in Chief to take corrective actions, keep databases current, or adhere to milestones. According to several independent studies on transportation, the Department of Defense (DOD) needed to consolidate transportation. Consequently, President Ronald Reagan on 18 April 1987 ordered the Secretary of Defense to establish a Unified Transportation Command (UTC), a directive made possible in part by the Goldwater-Nichols Department of Defense Reorganization Act of 1986, which revoked the law prohibiting consolidation of military transportation functions. The UTC Implementation Plan (IP) outlined the new unified command's responsibilities, functions, and organization. 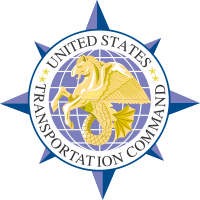 Christened United States Transportation Command (USTRANSCOM), its mission was to "provide global air, sea and land transportation to meet national security needs". It had three transportation component commands—the Air Force's Military Airlift Command (replaced by Air Mobility Command in 1992), the Navy's Military Sealift Command, and the Army's Military Traffic Management Command, (renamed Military Surface Deployment and Distribution Command in 2004). The JDA's missions and functions transferred to USTRANSCOM on 18 April 1987, when the agency became the command's Directorate of Deployment. Additionally, the IP located the command at Scott AFB, to take advantage of Military Airlift Command's expertise in command and control. On 22 June 1987, the President nominated Air Force Gen. Duane H. Cassidy as the first Commander, USTRANSCOM, and on 1 July the Senate confirmed the recommendation, thus activating the command at Scott. The commander of USTRANSCOM received operational direction from the National Command Authority (NCA) through the Chairman of the Joint Chiefs of Staff. USTRANSCOM appeared, at first glance, to be the long sought after remedy for DOD's fragmented and often criticized transportation system. Its establishment gave the United States, for the first time, a four-star, unified combatant commander to serve as single-point-of-contact for Defense Transportation System (DTS) customers and to act as advocate for the DTS in DOD and before Congress. But it soon became apparent that, in reality, the nation's newest unified command was created half-baked. The IP allowed the Services to retain their single-manager charters for their respective transportation modes. Even more restrictive, the document limited USTRANSCOM's authorities primarily to wartime. As a result, during peacetime, USTRANSCOM's component commands continued to operate day-to-day much as they did in the past. They controlled their industrial funds and maintained responsibility for service-unique missions, service-oriented procurement and maintenance scheduling, and DOD charters during peacetime single-manager transportation operations. They also continued to have operational control of forces. It took a wartime test by fire, Desert Shield/Desert Storm, to bring to maturity a fully operational, peacetime and wartime, USTRANSCOM. The strategic deployment for Desert Shield/Desert Storm ranks among the largest in history. USTRANSCOM, in concert with its components, moved to the United States Central Command area of responsibility nearly 504,000 passengers, 3.7 million measurement tons (4.2 million m³) of dry cargo, and 6,100,000 short tons (5,500,000 t) of petroleum products in approximately seven months. This equated roughly to the deployment and sustainment of two Army corps, two Marine Corps expeditionary forces, and 28 Air Force tactical fighter squadrons. The DOD learned much from the deployment to the Persian Gulf, and foremost among those lessons was that USTRANSCOM and its component commands needed to operate in peacetime as they would in wartime. Consequently, on 14 February 1992, the Secretary of Defense gave USTRANSCOM a new charter. Stating the command's mission to be "to provide air, land and sea transportation for the Department of Defense, both in time of peace and time of war," the charter greatly expanded the authorities of the USTRANSCOM commander. Under it, the Service Secretaries assigned the components to the USTRANSCOM commander in peace and war. In addition, the military departments assigned to him, under his combatant command, all transportation assets except those that were service-unique or theater-assigned. The charter also made the USTRANSCOM commander DOD's single-manager for transportation, other than service-unique and theater-assigned assets. Because USTRANSCOM must respond quickly in support of US objectives worldwide, the command must focus its attention across the full spectrum of support from humanitarian operations to contingencies. In 1995, USTRANSCOM supported 76 humanitarian missions and 94 Joint Chiefs of Staff exercises, visiting approximately 80 percent of the 192 countries. Since Desert Shield/Desert Storm, USTRANSCOM has continued to prove its worth during contingencies—such as Desert Thunder (enforcement of UN resolutions in Iraq) and Allied Force (NATO operations against Serbia)--and peacekeeping endeavors—for example, Restore Hope (Somalia), Support Hope (Rwanda), Uphold Democracy (Haiti), Joint Endeavor (Bosnia-Herzegovina), and Joint Guardian (Kosovo). Likewise, the command has supported numerous humanitarian relief operations transporting relief supplies to victims of natural disasters at home and abroad. After the 9/11 terrorist attacks, USTRANSCOM became a vital partner in the United States' Global War On Terrorism supporting the warfighter in Operation Enduring Freedom (Afghanistan) and Operation Iraqi Freedom (Iraq). From October 2001 to the present, USTRANSCOM, its components, and its national partners have transported over 2.2 million passengers and nearly 6,100,000 short tons (5,500,000 t) of cargo in support of the war on terrorism. On 16 September 2003 Secretary of Defense Donald H. Rumsfeld designated the Commander, USTRANSCOM as the Distribution Process Owner (DPO) to serve "as the single entity to direct and supervise execution of the Strategic Distribution system" in order to "improve the overall efficiency and interoperability of distribution related activities—deployment, sustainment and redeployment support during peace and war." With the most capable and ready air, land, and sea strategic mobility forces in the world, and with the authorities as the DPO, USTRANSCOM will continue to support the United States and its allies, in peace and war. This article includes text from the public domain USTRANSCOM Official Homepage. ↑ www.transcom.mil Vision. Retrieved 16 June 2010.